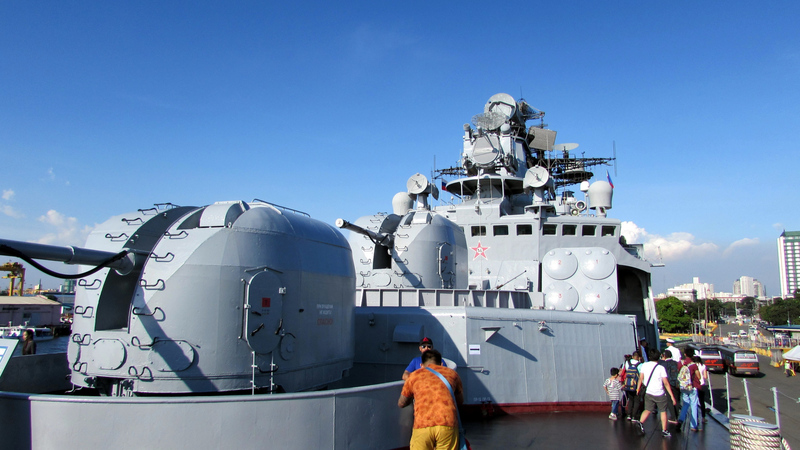 The AK-100 main guns and bow side superstructure of the Admiral Vinogradov Destroyer. Photo courtesy of Wikimedia Commons. After a couple of tries this year, I finally got to go onboard one of the Russian Navy’s ships at the Manila South Harbor, the Admiral Vinogradov (554), an Udaloy I class Destroyer. It wasn’t easy, but it was a good experience as these ships are not as common in our shores, especially before this administration of President Rodrigo Duterte. One reason I was able to get in this time was because there was a better overall organization of the queueing system for going into the ship. First was that they finally got a fairly competent guy to handle the queue who worked hard, communicated well and had a good system for queueing the people up.